Just home from our final vacation of the summer and ready for some raw food. 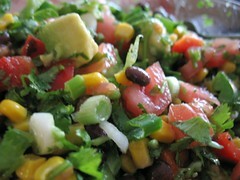 Here's the encore performance--three more reasonably healthy salad recipes. The ingredients for the BBQ chicken and Southwestern salad are almost the same. Any of these salads can be topped with grilled chicken or salmon. The “Just Chicken” grilled strips in TJ’s refrigerated section make adding meat easy. I'm experimenting with quinoa recipes so hope to have a tasty one up in the near future. 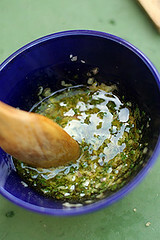 Mix ingredients, toss with BBQ sauce to taste. I’ve seen a dressing for this type of salad made from BBQ sauce mixed with equal parts ranch dressing or BBQ sauce mixed with mayonnaise in a 2:1 ratio. Garnish with avocado. 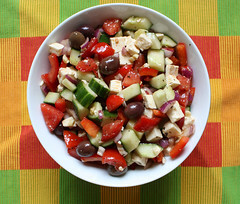 i can't wait to try the greekish flair salad, it sounds delicious!! yes, it's really cooling on a hot day!